There’s a cadre of boy students in my makerspace. These students, all self-identifying as boys, talk about models of real gun alongside “railguns” and other fictitious video game weapons without any distinction. Currently, several are working on rebuilding and modifying Nerf dart guns to make them shoot rapid fire. Let me take an unusual position as a teacher in saying that I think we can’t address their fascination without accepting it. There are legitimate reasons that kids like play weapons, and we do nothing to make them feel understood by banning their fascination. And without feeling understood, those kids won’t trust our perspective. 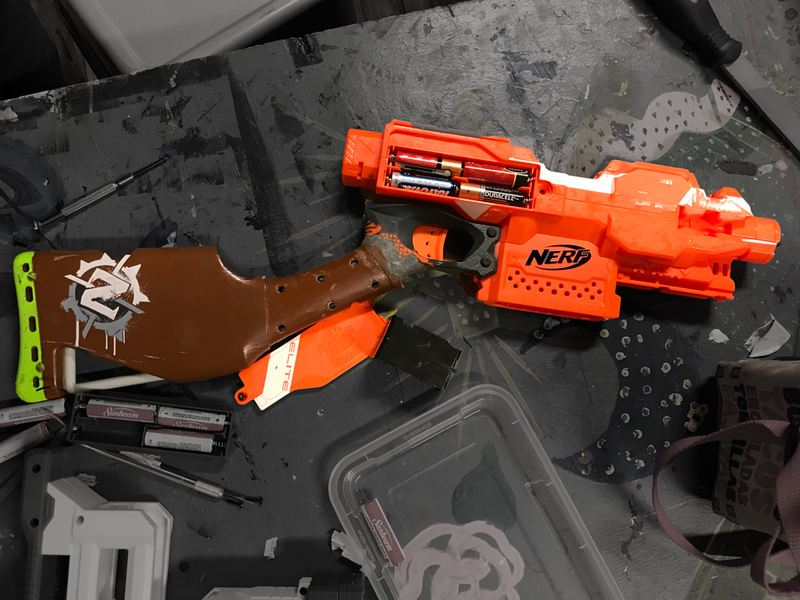 I have some stringent rules about the Nerf guns that they’re excitedly modifying, the primary one being that, within LightHouse, they may not point them at anyone. This is still true with of a consenting target because they’re in a social space, and our social environment includes people wandering in from other rooms all the time. We have students who have experienced real gun violence and it’s important to me that they not be required to confront or discuss their experiences with violence just because other students are play fighting. But, likewise, it is utterly important to me that we not confuse play fighting with violence and that we respect consent. “Don’t point it at anyone” is an important rule in my space because it lets us discuss why they’re so fascinating without it turning into a threat. Guns seem to be fascinating for a couple of reasons. Teenagers, in particular, live a contradiction: they are gaining adult-like powers, but adults (for good reason) don’t yet trust them to use those powers. Kids know how to apply force before they’ve had an opportunity to practice with it. Play fighting is how to practice using power. Play fighting is a consensual activity and it takes lots of forms, from friends shoving each other, to parasexual, flirty behavior. When teenagers playfully talk about using weapons (not teenagers who have real experience with violence, though) it’s about establishing yourself as being unattackable. They don’t want a gun that shoots straight. They want a gun that they don’t have to aim. I experienced this a lot when I used to play paintball: for me, at 30 or so years old, the game was all about sneaking around, tagging a sentry out so the opposing team doesn’t know where we were, then doing it again until we had the flag. For the younger kids, it was all about filling the air with paint, assuming that power was about unbridled frenzy, rather than whether you stayed calm and focused on scoring, whether you could develop a plan with your team, and whether you could laugh and congratulate your opponents when you lost. Kids watch adults with all of our skills that they don’t understand, and all of the tools we know how to use, and in their inexperience, don’t know how to get from there to here. They want to find the secret, and the illusion we give is that such power comes from our tools, not our grace in handling them. Guns, also, are a way of distancing oneself from violence. In addition to the simple human amazement that, “I did something here, but something happened over there!”, they represent a certain hesitancy to engage in personal violence. When you shoot at something, you want it to be far from you, to keep it from getting close enough to hurt you. Consider the difference between a student making a Nerf gun and a student making a Nerf guillotine. This is why I feel like there’s a big difference between the kids who talk about knives and the kids who talk about guns. The kids (there have been two) who joking-not-joking talk about using a knife on someone are kids who have experienced real violence. They don’t want to make a big noise or carry around an interesting, intricate machine. They want to be able to hurt someone who wants to hurt them. Guns are like simple engines. They require precision, the storage of energy, and then the release of that energy in a controlled direction. Then they have to be able to do it again. But unlike an engine (say, a compressed gas engine or an internal combustion engine), the power transfer stops at the piston. The precision required by building or modifying a gun gets to a certain point, and then is released into the air. That means that the engineering problem is approachable to a student who is just learning how things work. If that piston had to work a flywheel and a gear train, each subsequent part has to precisely match its other parts, and failures will teach the students less. Of course, there’s no avoiding talking about the ethical questions of a gun just because we’re seeing how they work. It would be silly of me to avoid questions of consent in my class just because of the nature of a particular machine. I don’t allow students to violate each other’s consent — not with touch, not with hateful words, not with threats. No one can point an X-Acto at anyone else, either (irrespective of consent, of course.) No one can even point a ruler at another student. It’s a workshop. Everything else in there is actually more dangerous than the Nerf guns. But remind you of our special rule: you can’t point anything like a gun at another person because, when you do, everyone else, whatever their feelings about it, has to be part of the interaction. Toy guns give us a chance to discuss why we have these rules, rather than simply requiring unquestioning obedience, and we try to encourage conversation and consent over obedience. We also talk about asking for and receiving consent for affection, for other kinds of play fighting, even for how students want to be called, from their name and gender pronouns to racial epithets, however well-intentioned. But by drawing a line between play fighting and violence, we open a dialogue about violence that they might not otherwise be able to have, for fear of institutional rejection. And we need those kids to be able to trust us.